Home » panda bears » wetnwild » Panda Bears! 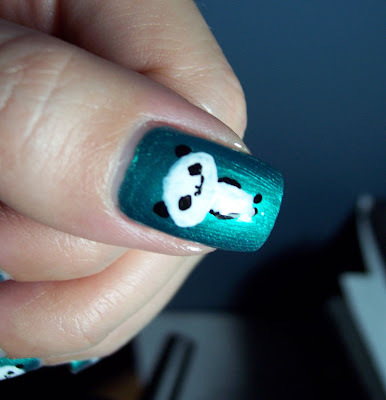 I think panda bears are so cute, I decided to draw them on my nails today! I tried using my eyeliner brush that I don't use anymore since my art brush got bent. I found out it did not deliver with the fine detail work I need to do so that was a bust. I had planned on drawing bamboo in the background but had to scrap it. I think they could've been more "chubby", yah? Maybe more chubby... i don't know! I like them! The big heads are good enough! SOOO CUTE! I think these turned out cute!! Come chubby ones would be really cute too! Hi Kae! Just found you on Brooke's blog. How cute these pandas are. Fantastic job. I just love freehand art work done on nails. Well I love anything done on nails! 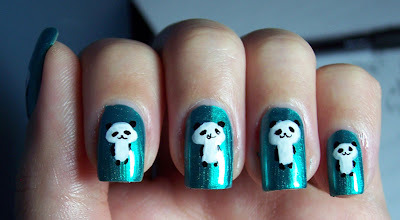 Lacquer Laine - Thank you, some of the pandas on my right hand (I'm right-handed) had gigantic heads because my left hand shook a little they look like mushrooms ha. The pandas are supercute! Yay! Hi Helen, thank you for reading! So cuuuuuuteeee !! is it difficult to realise this panda bears ? Figoline: Thank you, no it wasn't that bad since it has a pretty simple body shape too.